With the advent of globalization, almost every business has been forced to have an internet presence, where potential clients and existing customers can get information about the business and their products. Of course, if companies should have an online presence, individuals will also follow suit. It has become almost compulsory for different professionals, such as authors, singers and even dancers, to have an online presence today. The best way to establish an online presence is to create a website. The importance of having a website for business, its appearance and its user-friendliness cannot be overemphasized. A website is as vital to a business or company as the office is. Just like you do thorough research to decide the most suitable color pattern for your office, you must choose which colors best represent your business online. There are many ways to create a website. You can set up a website manually with many free templates available online. While creating a website may seem simple for anyone with basic knowledge of how to use the computer, software and Internet, you need to seek the services of a professional Vancouver web design company like us if you want to give your website a professional look and touch. The question on the mind of many business people who prefer cutting costs by creating websites on their own is; why do I need a web designer for my business? Well, a professional website designer is a one-stop shop for all your business website needs. They have a professional graphics artist, visualizer, content writer and a website development team. By hiring a professional and experienced web designer, you do not only get a great website, but you also get the best online identity for your company that money can buy. One of the major reasons to choose a professional for web design is the fact that you wont be worried about your website quality or getting your site up and running on time. By doing the work yourself, you may get caught between priorities. In such a case, you wouldn’t bother whether page 8 has been done properly or not, right? This is where a web design company with a wide experience comes in handy. Read on to understand the benefits of hiring a professional web designer in Vancouver. One of the main benefits of a professional web design company is their ability to develop a strategic plan. They will focus on the core business model and future business goals of your company. A Vancouver web design company will create a strong foundation for your site to ensure its long-term success. Such companies come with a team of web designers, copywriters, SEO specialists and coders who are extremely knowledgeable about today’s digital market. They know how to set up a great looking website that will attract incredible click through rates. Today most transactions happen directly online, so your web design should be of top quality. The website needs to give a good first impression. Have you ever attempted to set up your own website? Even with a good web design template, it may be hard to create a top-notch site. Web design will require certain codes, headers, images and plugins which are only known to professional web designers. A web designer will develop an attractive, dynamic and results driven website with a great user experience. The latest developments in technology have completely revolutionized the internet. So many people now make purchases online and so a website is an essential tool for business. It is quite easy to differentiate between an amateur template web design from a professional one. If you want people to identify your business with quality, then everything starts with the website design. Just look at the website of big companies, like Apple, to understand the importance of professional web design in business. Our Vancouver web design company can set up an exciting website built with your business brand in mind. A professional web designer not only focuses on users who come to your website by typing its address directly but also targets potential customers who have never heard about your business before. But how is this made possible? When users search for content on search engines such as Google, there are pages and pages of relevant results. Most users usually focus on the first page and ignore the rest, meaning that the websites that are not appearing on the first page will lose business. This is where SEO (Search Engine Optimization) comes in handy by increasing the chances of your website appearing on the first pages of search engine results. A professional web company will ensure that your website is SEO-optimized. Any web development agency today should have good knowledge of SEO. In fact, they need to have a SEO department in house. However, this does not mean that they would go overboard with SEO-optimized layout and content. This is where expertise and experience comes in the picture. Today most people use smartphones and tablets for accessing the Internet, so your web design should be compatible and user-friendly with such mobile devices. 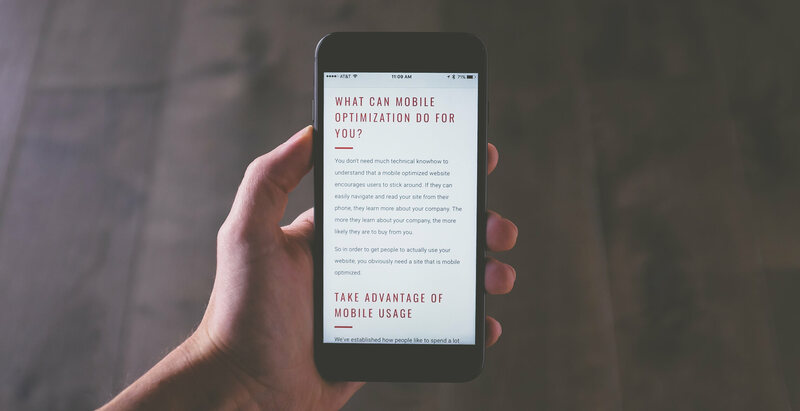 Mobile internet use is growing around the globe and if your web design does not incorporate the latest mobile technologies, then potential customers are likely to avoid your website. A web agency will develop a responsive web design, meaning that it will be compatible with various mobile devices. Reliable Web Design The danger of creating a website on your own is that it may develop some problems along the way that you may not know how to fix. Moreover, fixing such problems can be time consuming and costly that is if you decide to hire a web designer deal to with them. You will end up paying so much money for emergency service calls when a trusted web design company could have protected your website from such common errors in the beginning. Website maintenance can be very stressful for people with basic knowledge in computers, so it should be left to professionals. The benefit of hiring a professional Vancouver web design company is that you can just call or email them if something goes wrong and they will fix it right away. Another benefit of choosing a professional web designer is that they will help you one-up your competitors by incorporating the latest technologies and trends into your website. They can add new features to your site in a matter of seconds, something which if you want to do yourself could take so many days of learning. So if you want your website to be a force to reckon with in your line of business, then make sure you choose a professional to design it. A web design company will create a website with great functionality which would save you a great deal of time and increase the revenue of your business. With an online quoting system, appointment booking form or contact form, you will have a conveniently designed site which would save you the trouble of having to schedule appointments by phone. The website can even send automatic follow up emails with specific messages if you want. A slow loading site is likely to send visitors away, costing you considerable potential business opportunities. A Vancouver web design agency will incorporate various integrated features and plugins to provide incredible speed and security. The website coding plays an integral role on its overall functionality and performance. The advantage of seeking professional web design is that all these factors are taken into consideration to ensure that your website performs optimally. A good agency will make your site look trustworthy by using professional themes and content. Letting online users know that your company is trustworthy and giving it a human touch is vital if you want to boost your customer base. A balanced web design will provide potential customers with relevant information without compromising on professionalism. The Internet has transformed from an entertainment center to a shopping complex. Therefore, you need to have a website that responds to this need. But remember that you can only realize the benefits listed above if you seek the services of an experienced and reliable web designer. While there are many Vancouver web design companies, you need to choose a company that will produce amazing results.